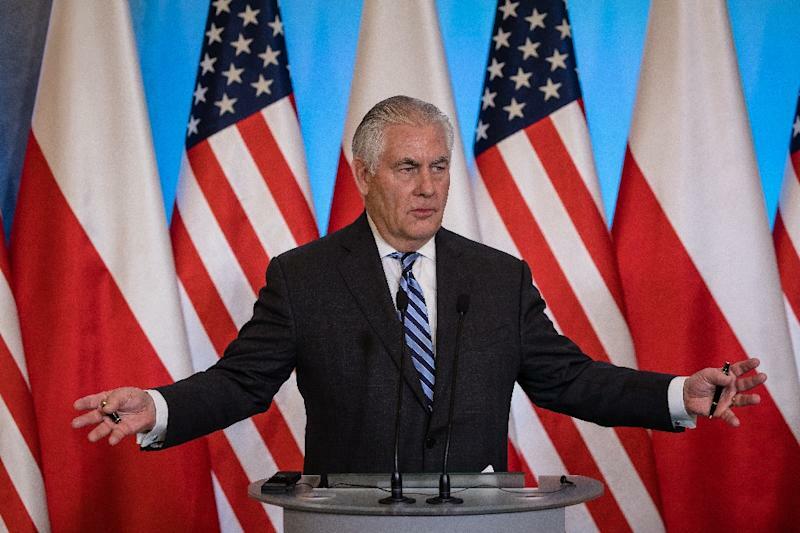 Warsaw (AFP) - US Secretary of State Rex Tillerson on Saturday said he stands by his claim that Russia bears responsibility for recent chemical attacks in Syria, despite strong denials from Moscow. "These are just unacceptable deployments of chemicals in ways that violate all conventions which Russia itself has signed up for. It violates agreements that Russia undertook to be responsible for identifying and eliminating the chemical weapons inside of Syria," Tillerson said during a visit to Warsaw. "The chemical weapons are clearly there, they're being used against civilian populations -- and the most vulnerable are children -- inside of Syria," Tillerson told reporters, in a joint press conference with Polish Foreign Minister Jacek Czaputowicz. "So we are holding Russia responsible for addressing this. They are (Syrian President Bashar al-) Assad's ally. They are members of those conventions and they made commitments. They need to deliver on those commitments." Tillerson first made the accusations on Tuesday, as diplomats from 29 countries met in Paris to push for sanctions and criminal charges against the perpetrators of the chemical attacks in Syria. Russia and China have blocked Western-backed efforts at the UN to impose sanctions on Damascus over their use. On Wednesday, Russia lashed out at Tillerson for having "hastily accused the Syrian -- as they call it -- 'regime' for the attack in Eastern Ghouta," adding "now they are trying to drag Russia into this as well." Damascus has been repeatedly accused of using chemical weapons, with the United Nations among those blaming government forces for an April 2017 sarin gas attack on the opposition-held village of Khan Sheikhun that left scores dead. There have been at least 130 separate chemical weapons attacks in Syria since 2012, according to French estimates, with the Islamic State group also accused of using mustard gas in Syria and Iraq. Next week, Moscow will hold negotiations in the Russian city of Sochi aimed at ending Syria's civil war. The Catch-up: What happens next for Notre Dame - and can it be saved?